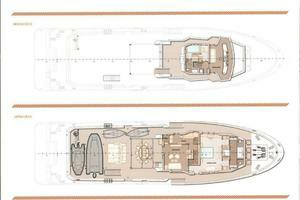 West Florida Yachts would love to guide you through a personal showing of this 132' Ocean King Ocean King 130 2020. 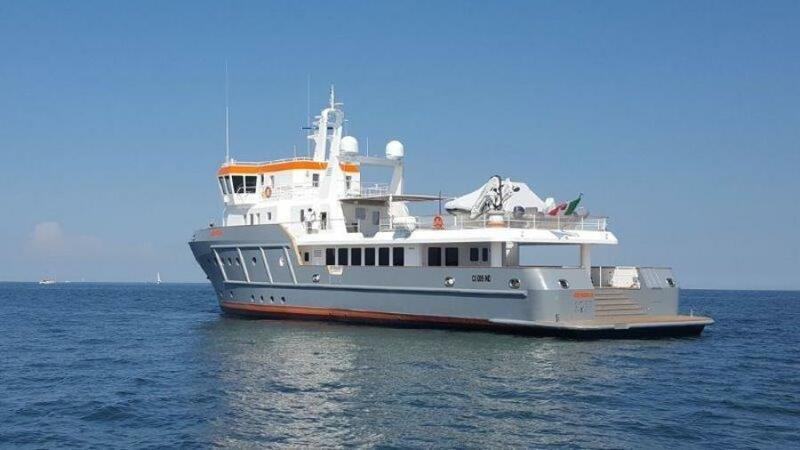 This yacht for sale is located in Unknown Italy and priced at $15,525,000. For a showing please contact us by filling out the form on this page and we will get back to you shortly! The plating, built up profiles and standard profiles are to R.I.N.A. specifications S275 JR (Grade A) or better. 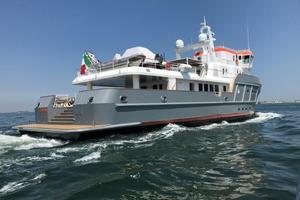 The workmanship and welding is according to the highest standards of shipbuilding and according to R.I.N.A. regulations. 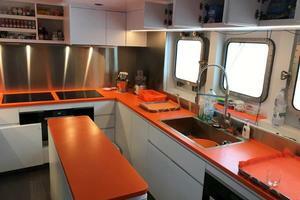 Topsides, decks and transom shall typically be fair and smooth. Sheer, deck lines and rub rails executed fair and without bumps. All welding work carried out by qualified welders. Where appropriate the welds will be ground smooth. 2 propellers ROLLA without nozzle of 1580 mm of diameter with five blades. The superstructure built in Steel S 275 JR Grade A thickness 5/16” ( 6 mm).weld in accordance with high standard RINA. The workmanship and welding shall be typically fair and smooth. Deck lines executed without bumps. All welding done by experienced welders. All external welds will be ground smooth. 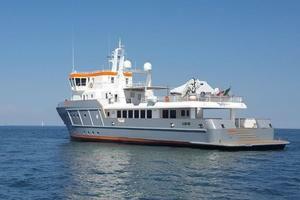 Superstructure painted with fully fairing High Gloss, International marine paint ‘Perfection’. 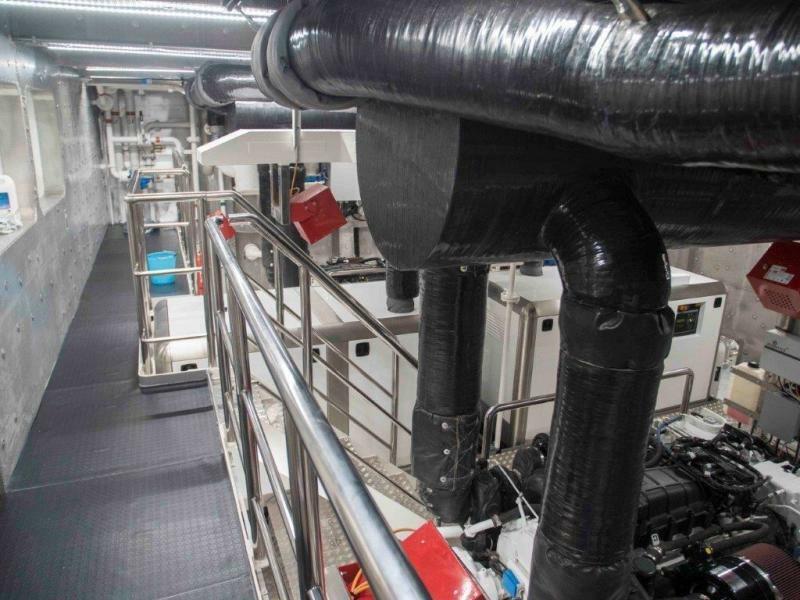 Two CAT C32 - 970 kW ( 1,319 hp) rated @ 1800 rpm rating C - continuous commercial duty marine diesel engines, four stroke, 12 cylinder V , turbocharged , intercooler with mechanically controlled fuel injection. 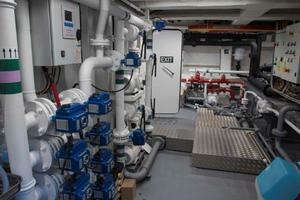 Fueling station on main deck (one starboard, one port) w/overflow tank, sight gauges and spill retention system. 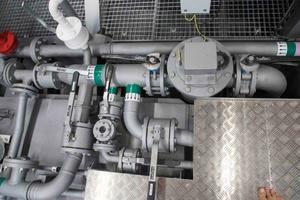 Large diameter piping port system vents in funnels in order to refuel diesel in few hours. 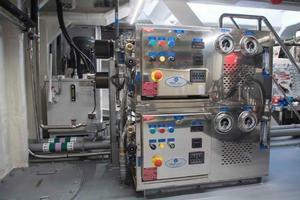 Fuel transfer system from tanks (nine) to day tanks (two) with pre-plumbed professional 400 V - 50 Hz pump ‘Gianneschi’ mod. ACB 531 - 4 Kw at 1450 rpm. 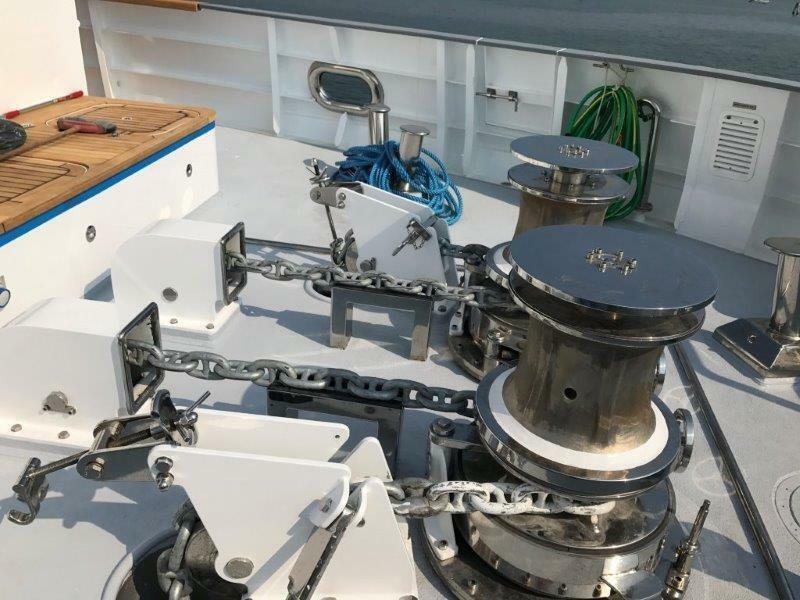 All the valves for transfer operation are with electrical attuators and will be controlled from the Automation plant through touch-screen monitor in Main Switchboard in engine control room and in pilothouse. The fuel transfer from tanks to day tanks shall take place through a centrifugal purifier with water separator Alfa-Laval capacity 600 l/h. Dual Separ filter/water separators 500 micron from day tanks to main engines with manifold. Fuel tanks (nine) all integral to hull, and two (2) day tanks. 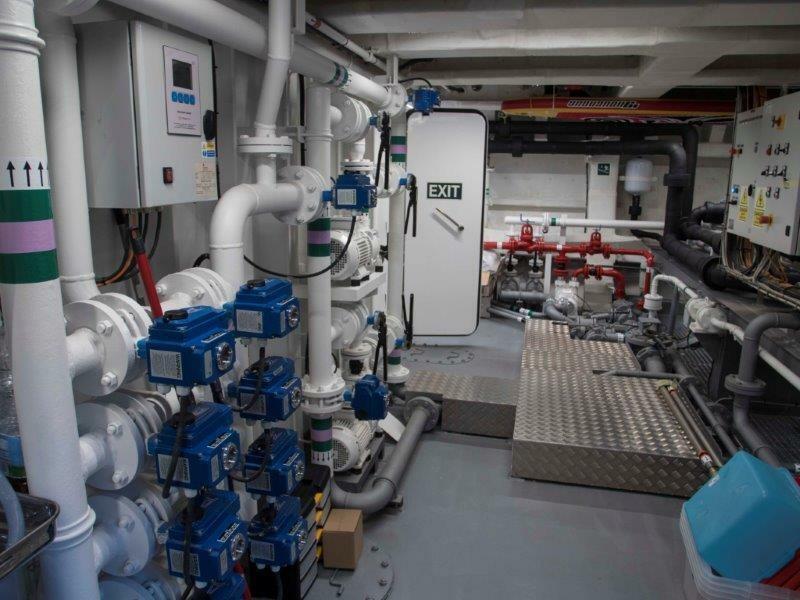 A complete professional bilge pumping system is installed with three professional bilge pumps 400 V- 50Hz 4 Kw each at 1450 rpm with a capacity of 20 M3/h with automatic alarms for high water in bilge and water sensor. 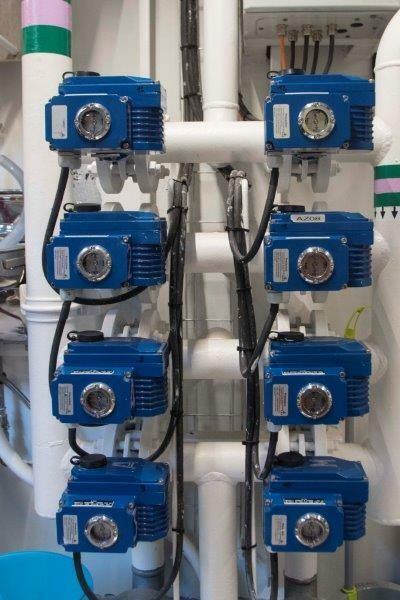 Each pump will have inline check valves and auto/off/manual selection switch. All pumps will be also used for fire-fighting use. All pipes will be in CuNi 90/10. The bilge tank shall have the capacity as foreseen by the regulations and a discharge line ashore in compliance with MARPOL regulations. 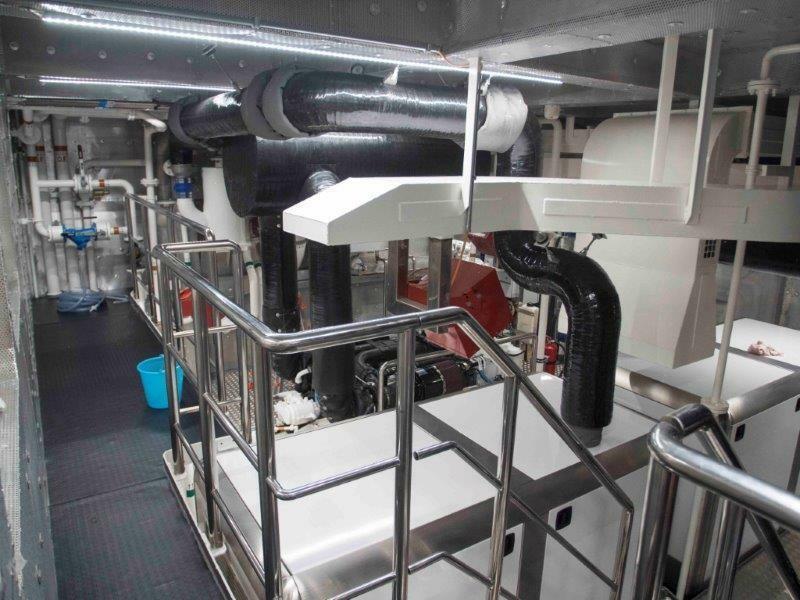 Valves plant will be electric Wafer type and will be controlled from the Automation plant through touch-screen monitor in Main Switchboard in engine control room and in pilothouse. RWO depuration system for bilge water is installed. 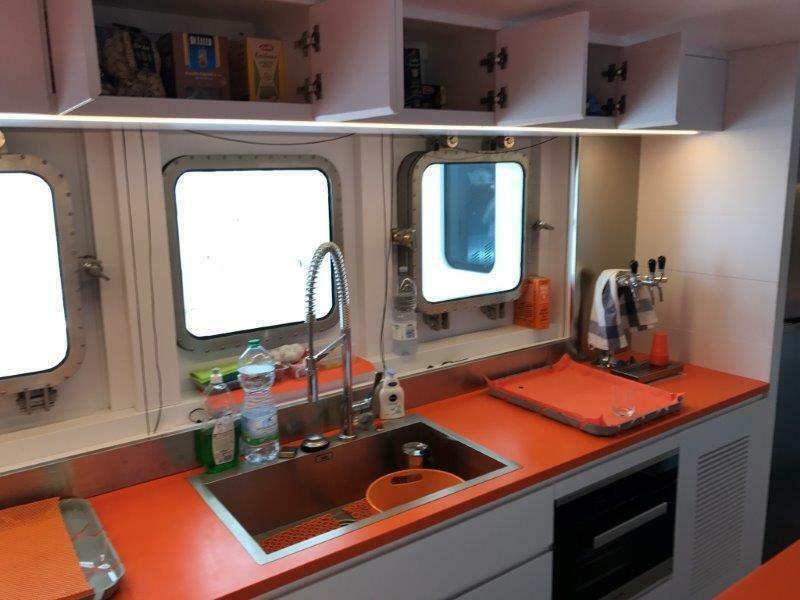 One complete water pressure system will be installed, with integrated stainless steel tank, two groups of two professional pre-plumbed JET pumps, 400 V- 50Hz , 2 Kw at 1450 rpm brand ‘Gianneschi’ with pressure tank, piping, valves, fittings, pressure gauge and pressure control. Two second JET pump for pressure wash down decks with some taps with quick coupling. 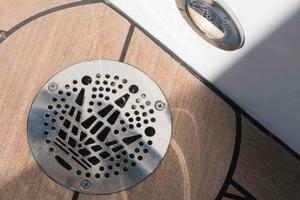 On swim platform will be installed one faucet with cold and hot water. 2 Electric hot water heater 300 l each with hot water professional pumps 400 V- 50Hz, 10 Kw. 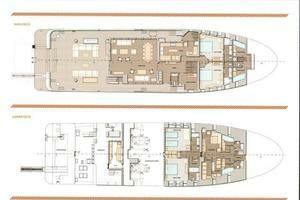 Four integrated tanks for ballast with a total capacity of 121,000 liter. All tanks are painted with epoxy coating. 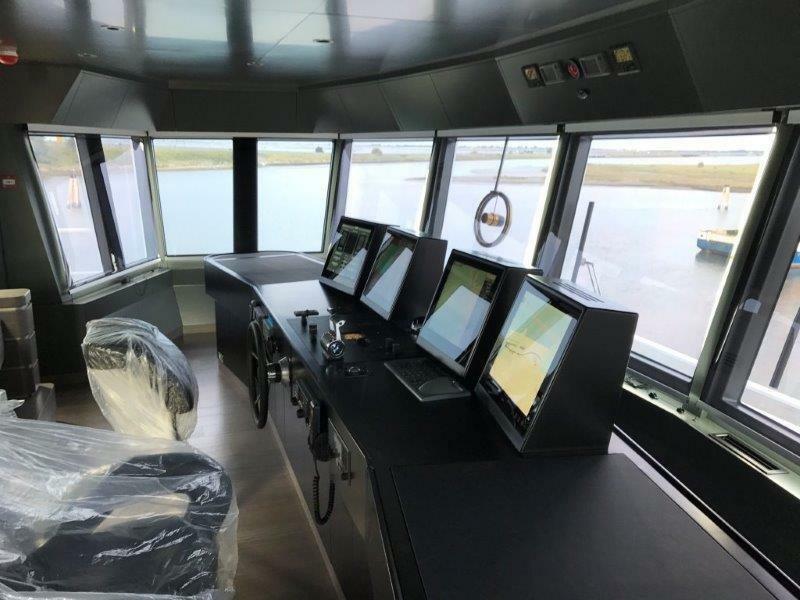 The system will be controlled from the Automation plant through touch-screen monitor in Main Switchboard in engine control room and in pilothouse. All pipes shall be realized in CuNi 90/10. 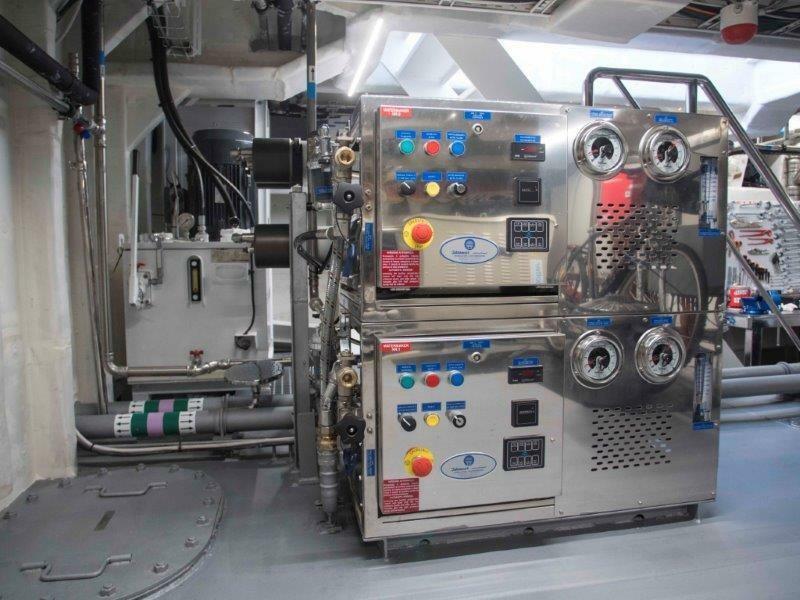 One tank for Black water with a capacity of 9,000 liters, with shore pump-out capability, and pre-plumbed pump for overboard discharge capability. 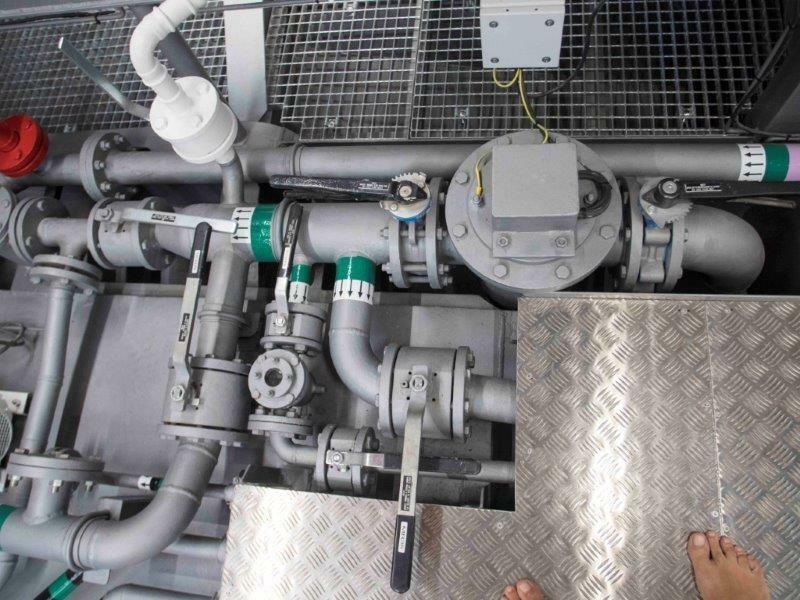 WC discharges shall be collected in appropriate tank provided with a breather at the shaft top, with a flexible pipe and deodorant filter and treated through a purifying plant with TECNICOMAR model Ecomar 16 , dimensioned for the number of people who can be embarked. Tank is painted with epoxy coating cycle. 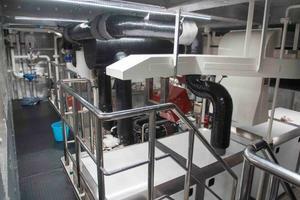 All pipes and accessories shall be realized in Stainless Steel AISI 316 in Engine room and in PE-HD outside Engine Room. 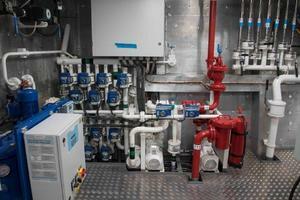 One tank for grey water with a capacity of 9,000 liter. The gray water of the hygiene rooms, of the kitchen and food stores, Laundry shall discharge by gravity into the collection tank. The gray water shall be directly discharged outboard or to the treatment plant TECNICOMAR model Ecomar 16. All pipes and accessories shall be realized in DRAIN 316. 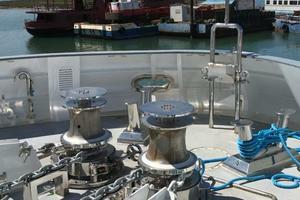 Two Stern 400 Volts, 11 kW with inverter professional winches brand: Romagnoli. 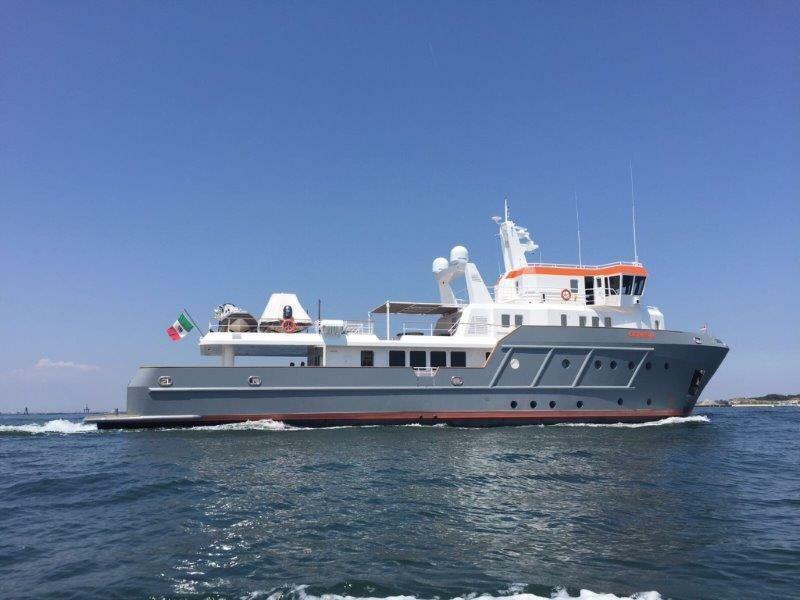 One professional Bow Thruster 400 Volts 110 Kw @1450 rpm rated for heavy duty application with joystick control unit and remote control in the pilothouse brand: Romagnoli model: BTX CC. One Professional knuckle boom type crane Hydraulic model AK16 with capacity 2,200 Kg, brand: HS MARINE with Remote controller. The plant consist in nr. 2 water cooler block, with heat pump. The Fan coils shall be placed in the insulated rooms for water/air treatment. CONDARIA brand or Similar with 480,000 BTU/h capacity with U.T.A. for lower deck. 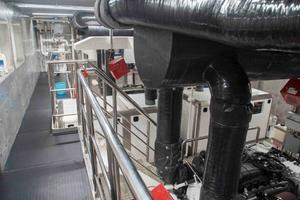 The plant will be monitored from Automation plant on board. In general the best thermal hygrometric conditions shall be guaranteed in hot and cold waters. The system is rated for Mediterranean use. A compressed air power stations shall be foreseen and planed in A.M., which will provide low pressure air (about 7 bar) for any automatism and board services. For such a plant an air cooled E/compressor, an air dehydrator filter and a tank with a capacity of 200 lt at 7 bar pressure. 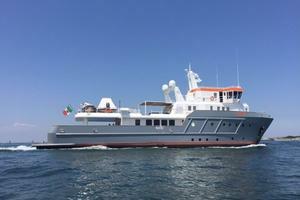 In the yacht will be installed one ‘Self Protection’ system with two emergency professional pumps 400 Volts 3 phase, 4 Kw at 20 m with direct connection to Sea Chest or through appropriate selection Valve through bilge tank and one diesel pump that can operated also in electrical power failure. 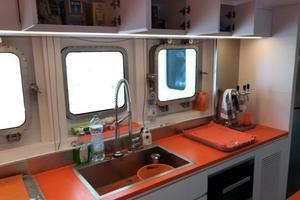 On board will be installed also a Diesel motor-pump for emergency. On board will be 6 fire-fighting stations with hydrants and hoses UNI45 type. 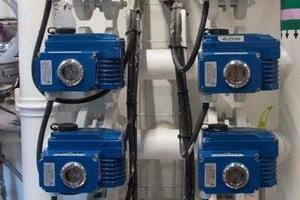 The system is controlled from Boening automation plant. All pipes will be realized in CuNi 90/10. 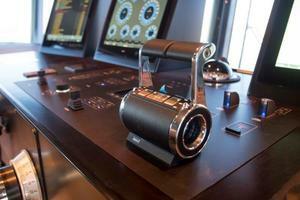 In the yacht will be installed one smoke detector in each room and one control detection system in Pilot House. 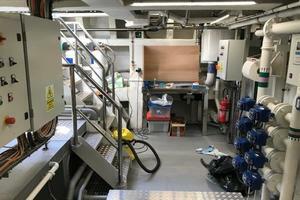 In the yacht will be installed one ‘AEROSOL’ fire-fighting system’ allocated in appropriate boxes direct in engine room. 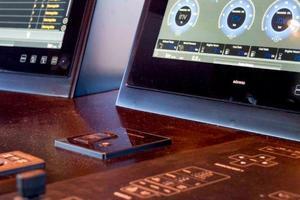 1 remote station with emergency control for closing diesel supply and axial-fan in engine control room. 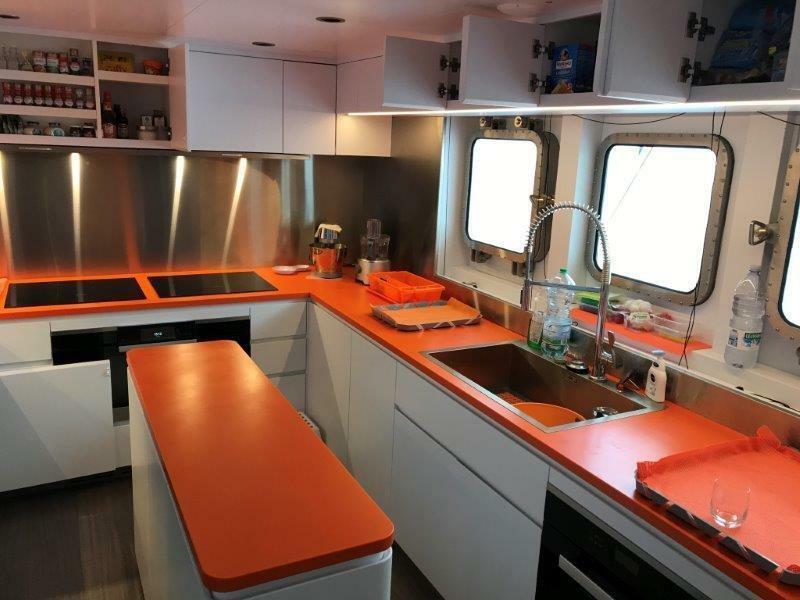 A state of the art Automation Plant will be installed on board, Brand BOENING with touch screen panel on Main Switch Board in control engine room and LCD monitor in pilothouse. 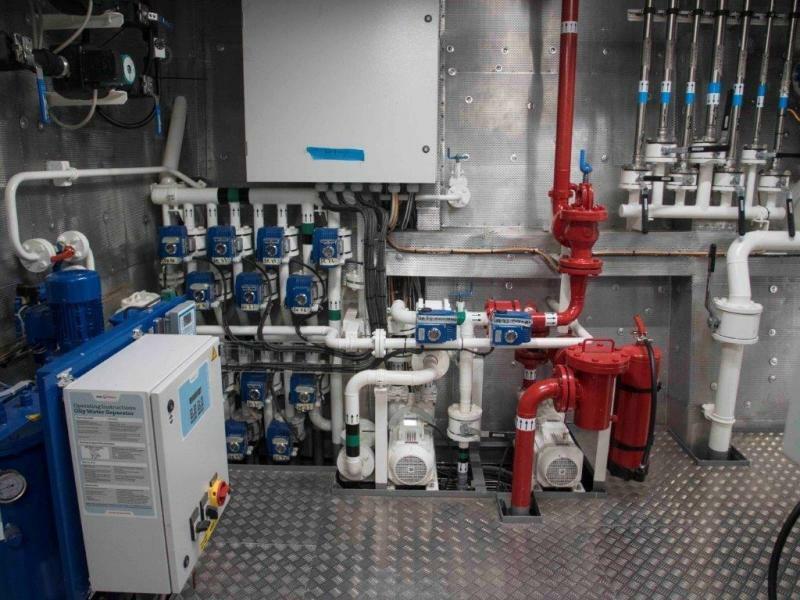 This Plant will control: Axial fans in engine room, Navigation lights, Bilge system, Fuel transfer, Ballast system, Fire-Fighting system pumps, Diesel plant, Tank liquid level gauges, Power Distribution, Generators parallel, Shore power, main Pumps, Cameras, Search lights, Wipers, Horn, Rudders. 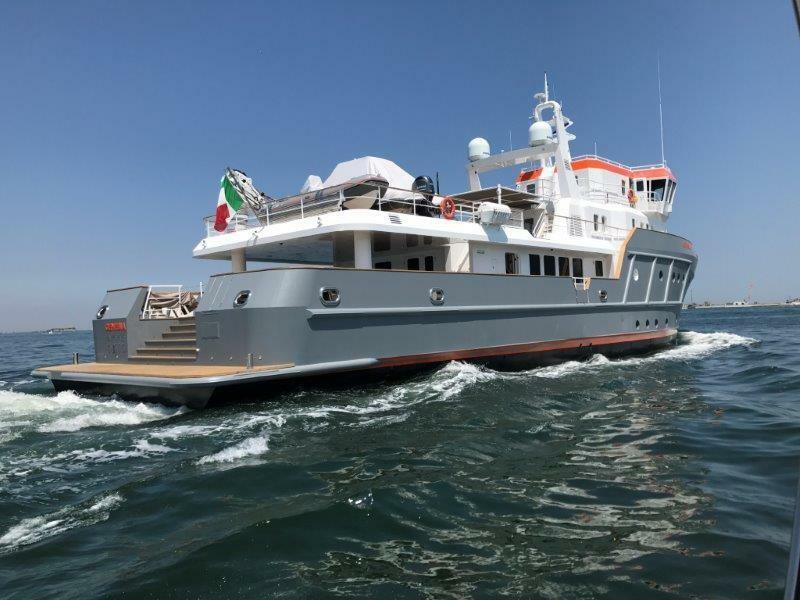 A state of the art Automation Plant will be installed on board, Brand BOENING with 4 touch screen monitors 19” in pilothouse, one touch screen monitor 15” in control engine room and one touch screen monitor 15” in Crew mess. 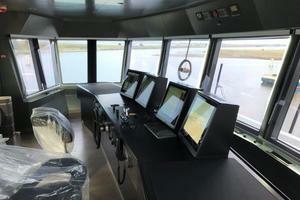 This integrated bridge, control of many system and integrated with FURUNO navigation technology (GPS, Radars, Autopilot, Chart Plotters etc.) grant a professional bridge look. 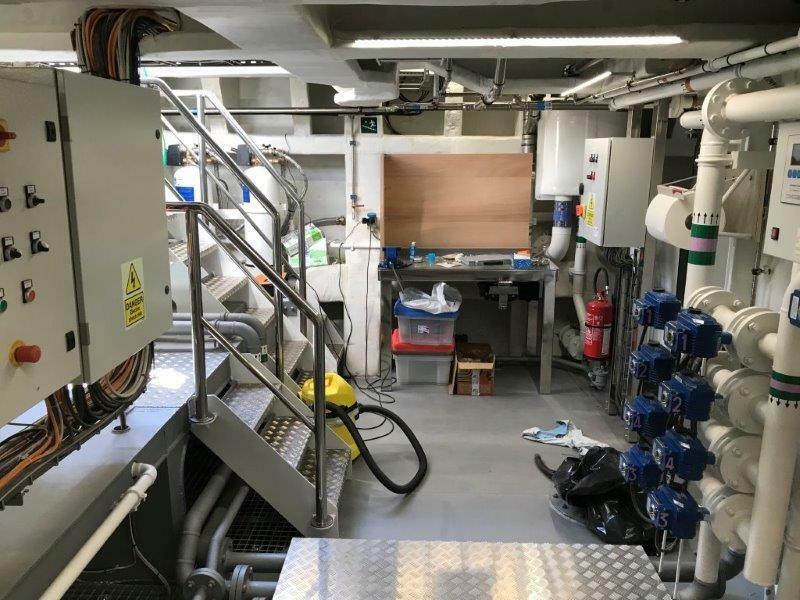 Two 400 V - 50 Hz CAT C 7.1 ACERT, 118 kW generators, in sound shield, with heat exchanger cooling, wet exhaust and exhaust separator, Plus One emergency generator CAT C 4.4 ACERT 50 kW . Aft shore power hook-up, with 125 amp 100’ Glendinning cable with connector 400 Volts 3 phase with connection at the board transformer for constant voltage and isolation assurance. Will be provided also an automatic parallel with the shore power in order to have no power failure during the change of power from generators to shore power and vice versa. 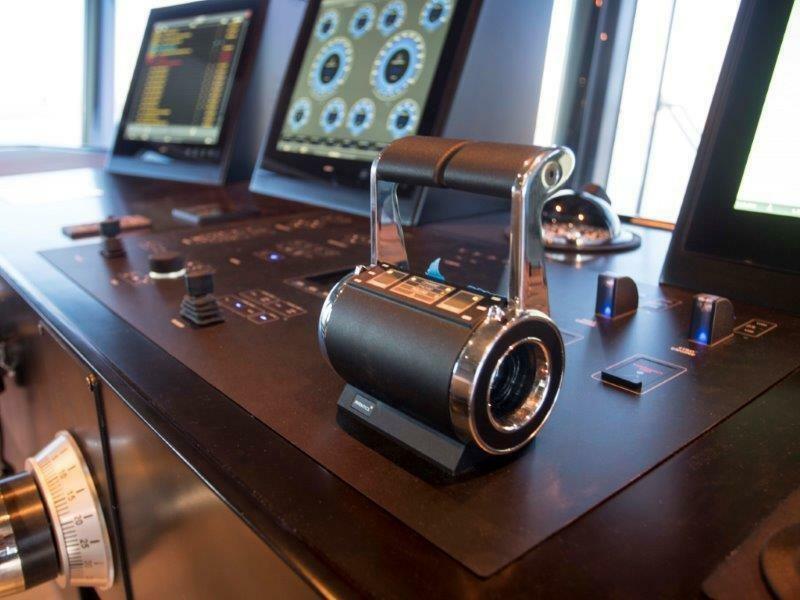 The Main switchboard with frontal access, Touch Screen monitor, constructed in steel or painted aluminum will be positioned in the engine control room. The Ship name realized in painting aluminum letters will be installed on Stern. On two Funnels will be installed the Ocean King Logo realized in Inox plate with backlit LED lights. On Valves, pumps and accessories will apply special identifying plates. On doors will apply appropriate hazardous labels. Inox Yard plate will apply on board. System of cathodic protection: The system consist in a series of zincs placed on the hull, rudder and propeller cuff. 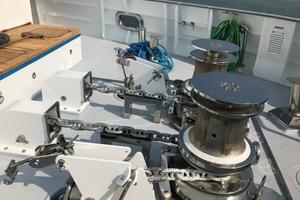 One Polipodio antifouling anodes electrical system is installed inside sea chests. he handrails realized in Stainless steel AISI 316 with a diameter of about 48 mm ( 1” 1/2) painted white. 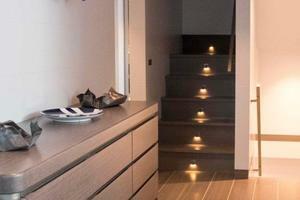 The external Stairs will also be equipped with handrails in Stainless steel AISI 316 painted white . Security and service handrails will be realized wherever necessary. The external decks will be covered with Natural Teak 14 mm thickness glued with vacuum technology, with a reasonable uniformity of color. Ceilings in wood with high gloss white color surface. 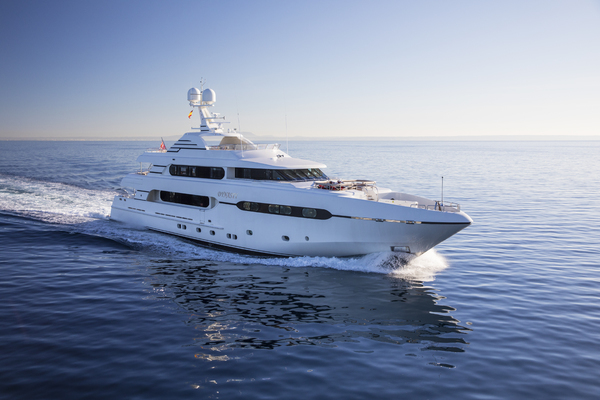 The yacht will be equipped with a half pipe 300 mm heavy duty fender in stainless steel for hull protection. All portholes with frame in AISI 316 Steel, brand SCM diam. from 450 to 550 mm with tempered glass and polished stainless steel glass list and security aluminum cover painted white. In accordance with RINA rules, some portholes can be open type with alarm sensor on Automation plant. 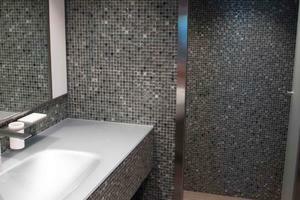 All Windows with sealed glass Dark grey color thickness glass 10 mm. All external doors shall be watertight and realized in light alloy, with arm hinge and block system in open position. 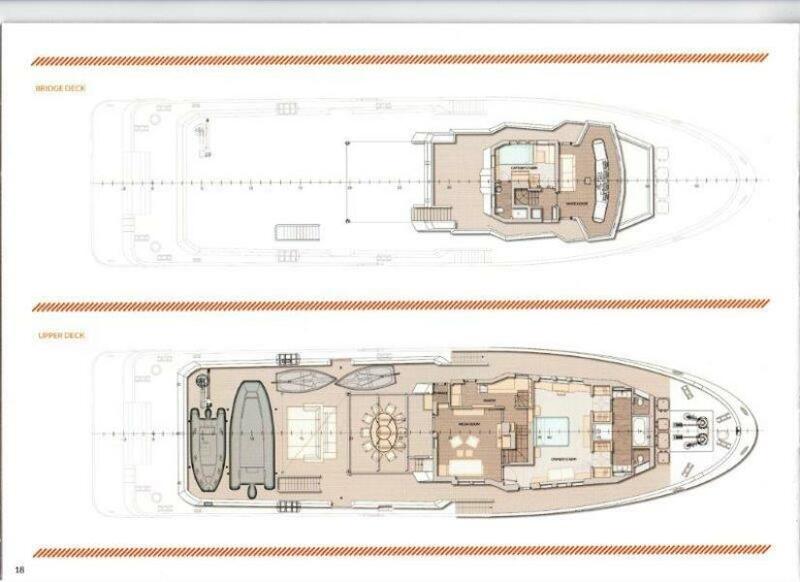 On Upper deck will be installed 2 ( one starboard, and one port) liferafts, Solas ‘A’ pack off-shore type with fiberglass shell. 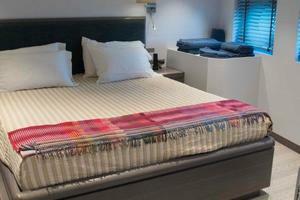 Type of curtain will vary space by space and may include venetian blinds or sun rolling blinds, brand MOTTURA. 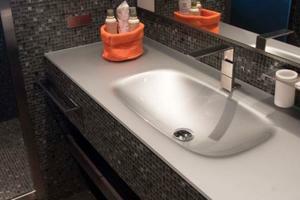 Stainless steel and corian top. - Oak furniture white color with wood accent white oak snow color. 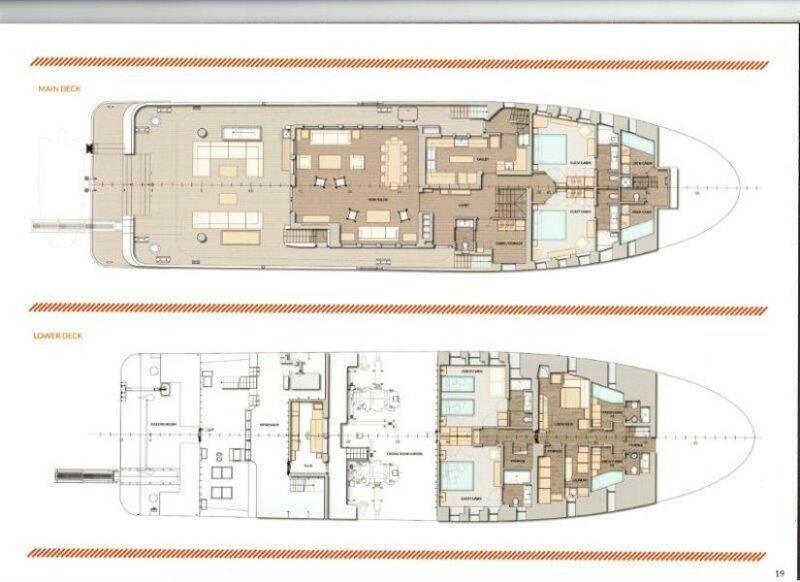 Owner and VIP suites, main saloon, upper deck and pilothouse lighting will be equipped with dimmers. Fenders & fender lines (8).